Vat Hat Siaow lies across the Mekong River and slightly up river from Luang Prabang town. 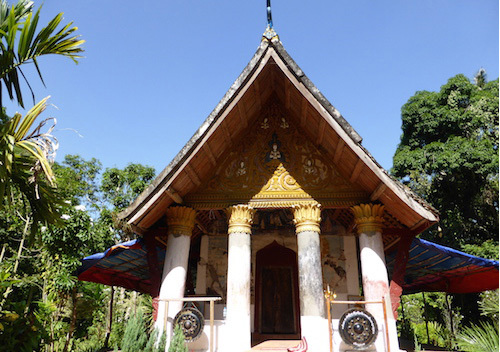 As with many temples and monasteries in Luang Prabang, Hat Siaow stands in an almost perfectly harmonious position. 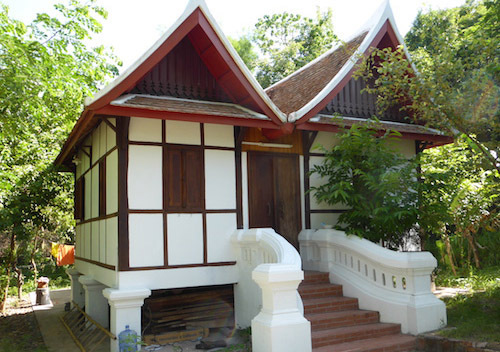 Traditionally it was a place of retreat and meditation for senior monks and for members of the former Lao royal family. Although abandoned for some years and decayed by neglect, since 2011 it has been reoccupied by an energetic young monk as abbot of the temple and a group of novices. 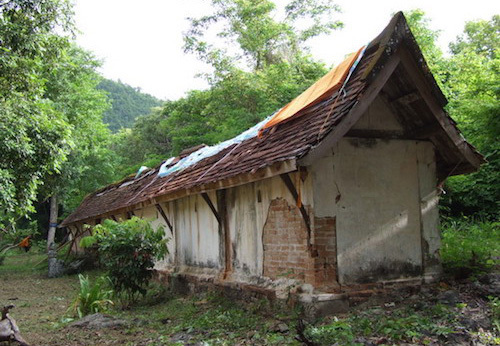 Thanks to the efforts of the abbot, and with support from the Buddhist Heritage Project (with significant help from the Badur Foundation and several private donors) much has been done at Hat Siaow to restore the structures. Alas the Sim, or chapel, which holds some of the finest wall murals in the country, is in very bad repair...restoration of this will require a huge and costly effort that has been beyond our Project's resources to this point. However, working with the abbot, and in conjunction with a large number of local Lao donors, significant restoration and new construction has taken place at this historically important temple. Please scroll through the images below for a glimpse into this important and appealing small temple. The front of the Sim, or Chapel, at Vat Hat Siaow. THe Sim has suffered the ravanges of time; the challenges of any restoration have delated any attempt at restoring the find interior murals. 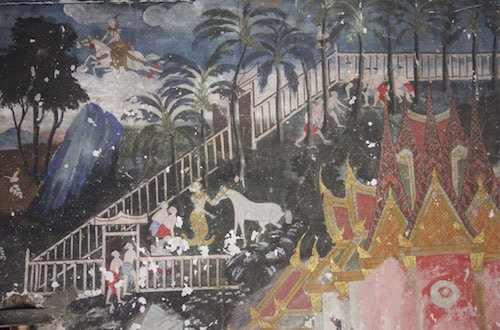 A section of the interior wall murals, some of the finest in Laos, although the deterioration and damage can be clearly seen. The murals tell the story of a mythical prince, his battles against invaders and eventural ascent to Nirvana. 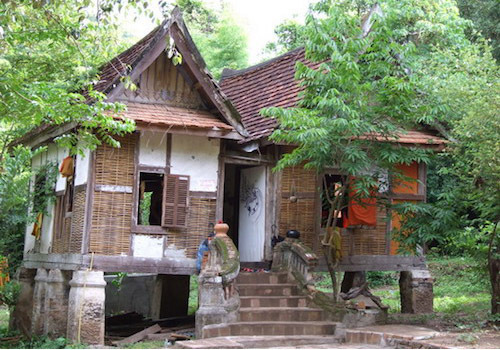 Vat Hat Siaow is home to a rare walking meditation hall. Here we see the centuries old hall in a state of neglect and decay. begging restoration. 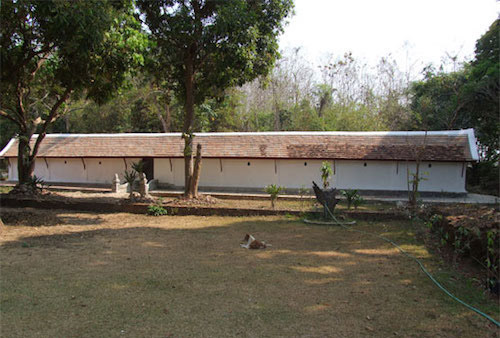 Thanks to help from the Badur Foundation of London, U.K., and private local donors, the monks and novices were able to restore the walking meditation hall to its original condition, and it is used daily by them for meditation. This khuti (domitory), more than 150 years old, was also in dire need of careful restoration. Now, once again with the help of local donors, the Khuti has been lovingly restored to its original condition, using traditional plastering techniques. 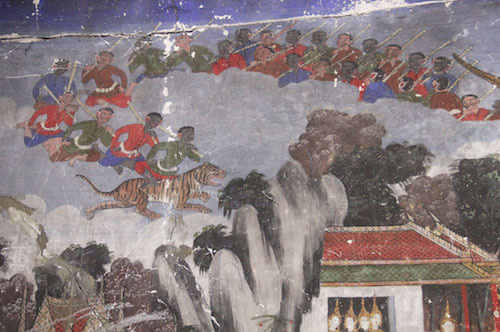 Another section of the remarkable, centuries old, murals on the interior walls of Vat Hat Siaow, here depiciting an invading army threatening the prince's palace and subjects.